“I prefer not to, although I sometimes decide to do it,” said Miuccia Prada in conversation with Raf Simons in eighth issue of System magazine on the subject of self-referencing. The latter half of that sentence is crucial as Mrs Prada did what she does best with her Resort 2018 show: contradict. (It was the first standalone women's pre-collection presentation from her; heretofore resort and pre-fall have been grouped with menswear, although she is insistent it isn't about titles to her, "a show is a show.") Contradicting her own attitudes towards design is a prime example of a designer realising the relevance of past work today: the idea was to strive for modernism. How does the past influence the present? A pressing question, no less. Its answer came in the form of an homage to Spring 2008, a collection inspired by fairies. Yes, fairies. The interpretation of fairies in September 2007 was much more of an allusion than a literal reference to the spritely, folkloric creature we read about. May 2017, almost ten years later, and it was about proposing a hyper-feminine modernism with tinges of sportswear and evening wear, a distinctively perverse comment on high fashion. The sportswear elements for Prada were about imbuing the show with youthfulness and modernity; there were black nylons used to convey this. Funnily enough, it was the label's mastery of this fabric that propelled them to mainstream success. The sportswear element contrasted sublimely with the sanguine saccharinity; it also prevented the collection from being an overload of frothy diaphaneity. Mining her own archive for inspiration proved for an inspired outing and it constantly addressed how the past informs the future. 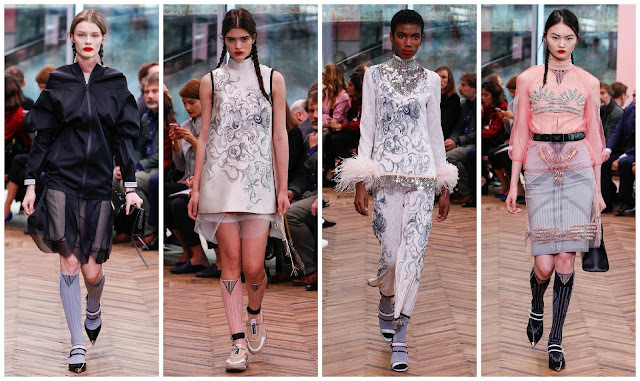 There were pieces reminiscent of the Fall 2013 Miu Miu collection (where she also considered the cross-pollination between sport and femininity); a peppering of Spring 2017's Chinoiserie feather embroideries was included in the show. Spring 2008's illustrations returned, a collaboration with James Jean. Hyper-femininity has never been something that has been of particular interest to Prada, she designs feminine dresses but they are never sickly sweet. However, that's not to say this collection lacked bite: it had plenty of it. There is a perversity to her interpretation of girlishness; dark colours contrast with light ones, creating a harsh, but pleasingly so, visual on the eyes. She examined where she succeeded previously and recreated that to varying degrees of success here. Having read the conversation in System, you gather a greater sense of Mrs Prada's character and it explains her design ethos: she is driven by her own creativity; the role of women in society is something she holds dear and it is reflected in her work by the way she crafts a personal narrative in order to empower women through their clothes. Her former Communist-affiliations are only a testament to her egalitarian attitude. It's her innate understanding of women that makes her such a compelling designer. She knows what women want but she has a more impactful resource besides that: she knows what women don't know they want.